There were no serious injuries in a crash inolving a school bus carrying nine students in Ottawa County late Wednesday afternoon. 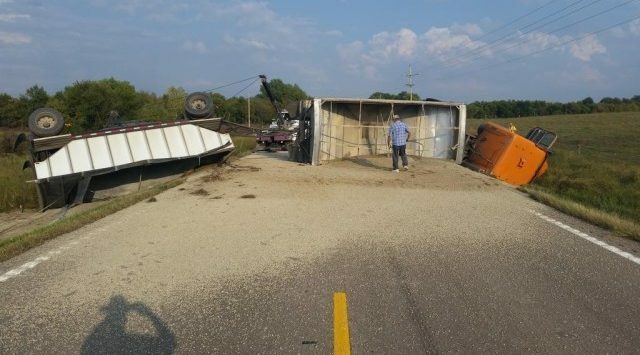 According to the Kansas Highway Patrol, a semi pulling two trailers loaded with rock was headed west on K 18 Highway. A school bus, which was headed north on Solomon Road, pulled in front of the semi. The semi made evasive maneuvers, but clipped the bus and came to rest on its side. One of the nine students on the bus, a 13-year-old girl, was transported to Salina Regional Helathe Center with a possible injury. Neither driver was hurt. The crash happened at 3:40 Wednesday afternoon seven miles north of Solomon on K 18 Highway.